Let’s face it. You can pick up a dozen red roses just about anywhere you look this time of year. But why not go for something a little more unique? We’ve curated some of the most beautiful bouquets and other arrangements from flower sites across the web! Luxe from The Bouqs Co.
For a soft and sweet Valentine bouquet that conveys a sense of innocent wonder, it’s hard to beat these beautiful tulips from Bouqs. 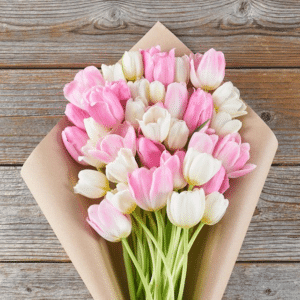 Choose 14, 28, or 42 stems of pastel pink and white tulip flowers, delivered at the peak of freshness for a long-lasting bouquet your loved one is sure to adore. Add in a mason jar vase for a display that’s both comfortable and elegant! 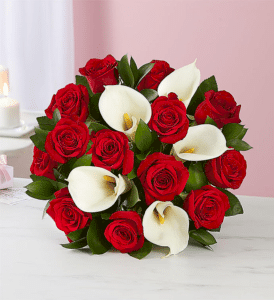 Pair classic Valentine’s Day roses with elegant and pure calla lilies in this stunning bouquet. A dozen long stem red roses is a fine gift for your sweetheart on February 14th. But why not add an elegant contrast with five white calla lilies? The whole bouquet is nicely complemented by deep green ruscus leaves throughout. Have the bouquet delivered as-is, or add a vase for easy display. And if you really want to pamper her, throw in a delicious box of Godiva chocolates too. If you want to send flowers, but wish there was an option that lasted longer, preserved blooms might be just the thing! 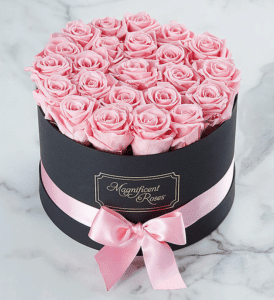 These beautiful preserved pink roses are a luxurious gift anyone would love to receive. These genuine roses are beautifully arranged in a round hatbox-style display with a coordinating ribbon and will last six months or more if cared for properly. If you want to mix things up a bit for Valentine’s Day, choose a bouquet with traditional red roses, mixed with other flowers in shades of red, white, and pink. We love this mix from Send Flowers because of the variety and size of the blooms on offer. Red roses and white Asiatic lilies take the center stage, blended with pale daisy spray mums and scarlet mini carnations. It’s all mixed with traditional greens and arranged in a ruby glass vase, ready to display and delight! 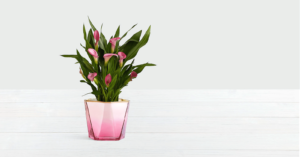 Send her a blooming plant she can keep and grow for years to come with this potted pink calla lily. Because these blooms have never been cut, they’ll last much longer than a normal bouquet. And when the flowers die, if you allow the bulb to go dormant for a couple of months, it will come back year after year for a long-lasting sentiment she’ll enjoy well into the future! For a special touch, be sure to choose the metallic ombre glass pot or the gold heart ceramic planter. This is a great gift for mom! A dozen roses is a classic, but doesn’t have to be boring! Ditch the pure red bouquet and check out this fun and creative tie-dyed bouquet! 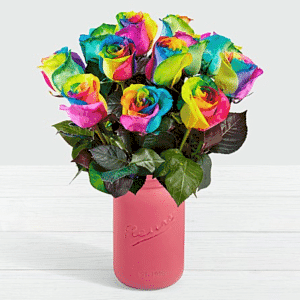 It features a dozen long-stemmed roses, in fresh and funky colors. Pair it with a clear glass vase or a fun pink mason jar. It’s a fun arrangement she’s not likely to forget. It’s perfect for your daughter, sister or someone else you want to surprise on Valentine’s day that isn’t a romantic love interest! 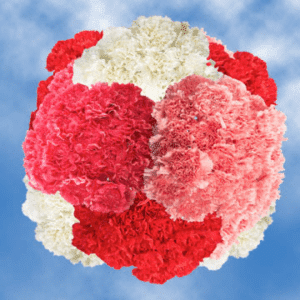 For an impressive yet traditional look, what about a giant red and white heart made from beautiful blooms? Lovely red carnations are fashioned into a heart shape, then surrounded with white Million Star gypsophila, and accented with classic green ferns. The whole bouquet is then presented in a red square vase, and accented with a perfectly coordinated red ribbon with white Xs and Os. Want to go even more traditional? Upgrade to the Deluxe version to switch out the carnations for red roses. This one is an excellent option if you’re looking for an over-sized bouquet, or if you want to break it down into several bouquets to gift to special people in your life. 100 carnations in perfectly selected shades of pink, red, and white are delivered as four bouquets of 25 stems each. Since carnations are hardy and long-lasting, they’re also an excellent choice for classroom gifts or to hand out to a crowd, but not necessarily for your girlfriend or wife. 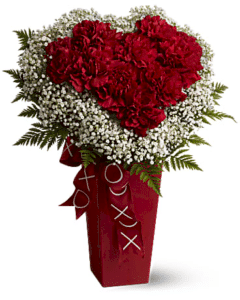 Ready to order flowers for Valentine’s Day? 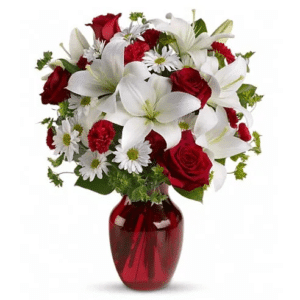 Check out our coupons for ProFlowers, FTD, 1800flowers, the Bouqs, From You Flowers and Teleflora or read up on the top online flower delivery websites. Happy Valentine’s Day from all of us at FlowerGlossary.com!